Green tea has always been considered by the Chinese and the Japanese as a potent medicine for the maintenance of health, endowed with the power to prolong life. The health-promoting properties of the tea plant are often attributed to the active ingredients that include polyphenols. Ultimate antioxidative and bioactive potential of green tea in vivo is dependent on the absorption, distribution, metabolism, and excretion (ADME) properties of the catechins within the body after ingestion and the reducing properties of the resulting metabolites. It has antibacterial, antifungal, anticancerous, anticaries, antiperiodontitis properties; is effective for weight loss; and also arrests the exacerbation of pulpitis. Clinical applications of these potential benefits warrant further investigation through scientifically sound research prior to any definitive statements. The article was aimed to review the dental benefits of green tea as very few articles are documented. The literature was searched through Google search engine, EBSCOhost, and PubMed Central. Data were collected and the articles pertaining to dental implications were selected for this article. 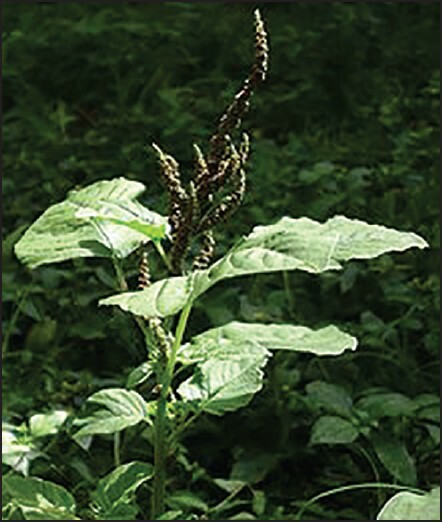 Objective: This study aimed to evaluate the wound-healing potential of the ethanolic extract of Amaranthus (A.) viridis leaves in diabetic rats. Materials and Methods: Diabetes was induced by the administration of a single injection of alloxan monohydrate (120 mg/kg, i.p.) prepared in citrate buffer to experimental animals. The wound-healing activity was evaluated by three methods: excision, incision, and dead space wound models. The diabetic animals were divided into five groups, as follows: Group I, which received alloxan treatment only (diabetic control); Group II, which received topical mupirocin ointment (2% w/w) (standard); Groups III, IV, and V, which were treated with ointments prepared from A. viridis extract of 2%, 5%, and 10% w/w, respectively, daily (test groups) till the wounds completely healed. Wound-healing parameters such as the rate of wound contraction, epithelization, tensile strength, and concentration of hydroxyproline content were measured and compared with diabetic control using one-way analysis of variance (ANOVA) followed by Dunnett's test. Results: Rats treated with the prepared ointments of A. viridis extract had shown a significant (P < 0.01) increase in the percentage of wound closure, tensile strength, and hydroxyproline content of the granulation tissue when compared with the diabetic control, in a dose-dependent pattern. Conclusion: These findings demonstrated that the ointments of A. viridis leaf extract effectively stimulate wound contraction and accelerate wound healing in diabetic rats. Background: Epilepsy is one of the most common, serious neurological conditions, affecting more than 50 million people worldwide. 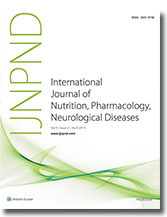 This disorder is characterized by the occurrence of spontaneous and recurrent seizures due to the abnormal, excessive, and synchronous electrical firing of neuronal networks Aim: The objective of the present study was to evaluate Pistacia integerrima (PI) gall extracts in acute models of epilepsy for their anticonvulsant activity. Materials and Methods: Extraction of galls of PI using a Soxhlet apparatus was carried out to yield petroleum ether and methanolic extracts. Both the extracts were screened in pentylenetetrazole (PTZ)-induced seizures in the zebrafish model. The active extract was further evaluated in the PTZ-induced seizures in mice. Both extracts were further screened in the maximal electroshock (MES) model in rats. 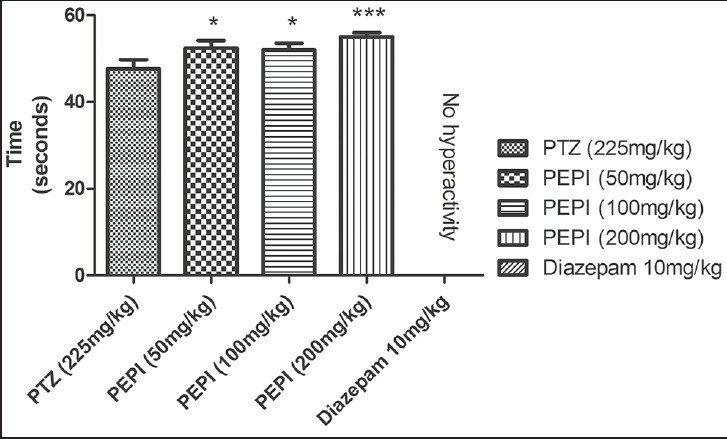 Results: The petroleum ether extract of Pistacia integerrima (PEPI) exhibited dose-dependent delay at 50mg/kg, 100mg/kg, and 200 mg/kg in the onset of different seizure parameters in PTZ-induced seizures in the zebrafish model that was further confirmed in mice at 50 mg/kg and 100 mg/kg. In addition, the extract exhibited delay in the duration of hind limb extension (HLE) as well as protected from it at 50 mg/kg, 100mg/kg, and 150 mg/kg in the MES model in rats. The metabolic extract of Pistacia integerrima (MEPI) was unable to protect from seizures in both preliminary screening (PTZ and MES) models. Conclusion: The results showed that PEPI demonstrated potential anticonvulsant activity in zebrafish and rodent models of epilepsy. This may be attributed to the presence of essential oil and its phytoconstituents, indicating its role in suppressing generalized absence and tonic-clonic seizures. Objective: The present study was designed to investigate the antidiabetic potential of the bulbs of Urginea indica (Roxb.) Kunth. (U. indica), which has been utilized traditionally to cure diabetes mellitus. Materials and Methods: An acute toxicity study was done to check the toxicity of U. indica ethanolic extract (UIEE) and an oral glucose tolerance test (OGTT) was carried out in a study population of normoglycemic rats. Diabetes was induced by single intraperitoneal injection of streptozotocin (STZ, 40 mg/kg body weight). Animals were orally treated with the extracts and standard drug (glibenclamide 10 mg/kg), and vehicle daily for 14 days. Hypoglycemic effects, change in body weight, lipid profile, and feed and water intake of the diabetic rats were assessed for normal, diabetic control, standard, and extract-treated groups. Histopathology was also carried out for the pancreatic tissue. Results: The acute toxicity study revealed the nontoxic nature of U. indica ethanolic extract. A considerable decrease in blood glucose was observed within 120 min on glucose tolerance testing among normoglycemic rats treated with a high dose of extract UIEE (1.5 g/kg). Daily oral treatment with the extract and the standard drug for 14 days significantly reduced blood glucose, total cholesterol (TC), and triglyceride (TG) levels. High-density lipoprotein (HDL) levels were found to be improved compared to the diabetic control group. The feed and water intake in diabetic rats was markedly reduced and weight loss was minimized. Histopathological analysis confirmed the biochemical findings. Conclusion: The results of the experiments suggest that UIEE has significant antidiabetic effects on STZ-induced diabetic rats. Background and Aims: Alterations of ionized sodium, potassium, and magnesium in the serum or within erythrocytes have been reported in diabetes mellitus (DM) subjects, both as causes and consequences. There is also increasing evidence that electrolyte imbalances are early biochemical events responsible for long-term diabetic complications. Considerable variations in the electrolyte metabolism may exist in populations depending on the genetic constitution, nutritional status, and environmental situation. The present study was undertaken to investigate the serum and erythrocyte levels of Na + , K + , and Mg 2+ , and also to explore their relationship to glycemic status in a group of Bangladeshi type 2 diabetic patients without any complications. Materials and Methods: There were 30 newly-diagnosed type 2 diabetic subjects [age in years 45.17 ± 1.66; body mass index (BMI) 27.26 ± 1.59, M ± SD] who were studied with 30 age- and BMI-matched control subjects (age 46.30 ± 2.41; BMI 26.50 ± 1.78). 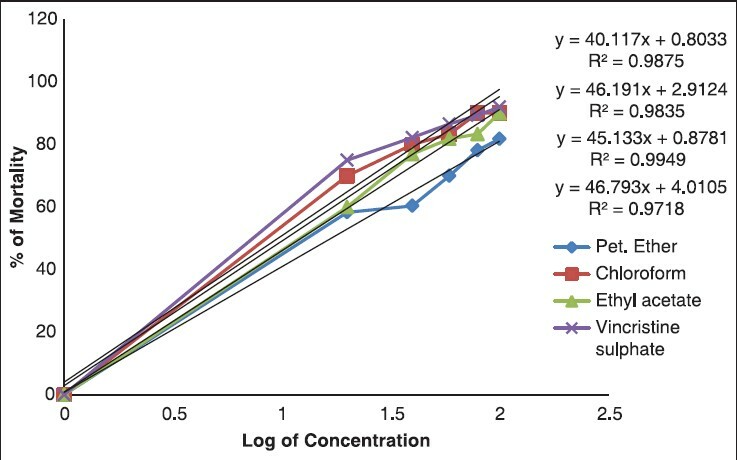 Serum and intracellular concentration of Na + , K + , and Mg 2+ were estimated by the ion sensitive electrode (ISE) method using an Auto Analyzer (Nova Biomedical Corporation, 200 Prospect Street, Waltham, MA 02254-9141, USA). Serum glucose and lipid profile were measured by enzymatic colorimetric method. Results: The serum levels of ions (mmol/L, M ± SD) in the control subjects were as follows: Na + - 145 ± 1, K + - 3.78 ± 0.25, and Mg 2+ - 0.47 ± 0.02. In diabetic subjects, significantly lower value of Na + (143 ± 2, P < 0.0001) and Mg 2+ (0.44 ± 0.03, P < 0.0001) and higher value of K + (4.19 ± 0.41, P < 0.0001) were observed. Serum Na + and Mg 2+ showed negative correlation (P < 0.0001 for both ions) and serum K + showed positive correlation (P < 0.0001) with serum glucose only in the diabetic group. In these diabetic subjects, erythrocyte Na + was higher [(values in mmol/L, M ± SD): 11.20 ± 5.40 in diabetic subjects vs. 10.40 ± 4.77 in control subjects, P < 0.0001] and erythrocyte K + [(values in mmol/L, M ± SD): 139 ± 4.8 in control subjects vs. 133.06 ± 3.71 in diabetic subjects, P < 0.0001] and Mg 2+ [(values in mmol/L, M ± SD): 1.82 ± 0.22 in control subjects vs. 1.75 ± 0.20 in diabetic subjects, P < 0.0001] were found to be significantly lower as compared to control subjects. A significantly positive correlation between erythrocyte Na + (P < 0.0001) and a negative correlation between erythrocyte K + and Mg 2+ (P < 0.0001) were observed with serum glucose. Conclusions: These data confirm the existence of hyponatremia, hyperkalemia, and hypomagnesemia, paralleled by a reverse change of Na + and K + in erythrocytes of type 2 diabetic subjects. The study also demonstrates that hyperglycemia-induced effects on cellular transport process play a major role in mediating the electrolyte imbalances in diabetes. Aim: The emergence and spread of antimicrobial resistance is a growing problem in both developing and developed countries and threatens to become a global crisis. In recent years, attempts have been made to investigate indigenous medicines used against infectious diseases, to help in developing safer antimicrobial and anticancer drugs. As part of the further advancement of this research arena, an attempt has been made to study the stem barks of Carica papaya Linn. (C. papaya; family: Caricaceae) and Tamarindus indica Linn. (T. indica; family: Fabaceae), two common plants of Bangladesh. The petroleum-ether, chloroform, and ethyl acetate extracts of the stem bark of both plants were investigated for their antibacterial activity and cytotoxicity. Materials and Methods: The antibacterial activity was evaluated using the disk diffusion method. Cytotoxicity was determined against brine shrimp nauplii. In addition, the minimum inhibitory concentration (MIC) was determined using the serial dilution technique to evaluate antibacterial potency. Results: All crude extracts of T. indica and the chloroform extract of C. papaya appeared very potent in terms of both zones of inhibition and spectrum of activity. However, all the extractives were also subjected to brine shrimp lethality bioassay for preliminary cytotoxicity evaluation. Here, the chloroform extract of C. papaya revealed the strongest cytotoxicity, LC 50 of 10.46 μg/mL. Conclusion: The stem barks of both C. papaya and T. indica show broad-spectrum antibacterial activity and may be potential sources of natural antimicrobial compounds and anticancer agents to be used in the treatment of various infectious diseases caused by resistant microorganisms and of cancer, respectively. Objective: The present study was aimed to evaluate the antimutagenic potential of flavonoidal fraction of Apium leptophyllum fruits (FFALF) and isolate the bioactive phytoconstituents from that fraction along with their subsequent characterization. 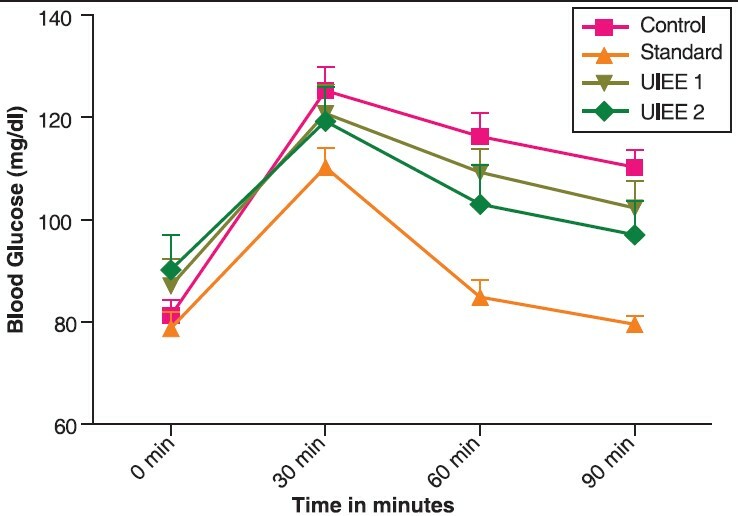 Materials and Methods: For mutagenicity study, a single application of FFALF at doses of 5 mg/kg, 10 mg/kg, and 20 mg/kg of body weight were orally administered to Swiss mice, 24 h prior the i.p. administration of cyclophosphamide (50 mg/kg). After 24 h of administration of cyclophosphamide, the rodents were sacrificed and the aberrant chromosomal cells as well as micronuclei formations from the bone marrow cells were compared with the positive control. Then, the phytoconstituents were isolated from FFALF using column chromatography and characterized by spectroscopic evidences of Fourier transform infrared spectroscopy (FTIR), mass spectroscopy (MS), hydrogen-1 nuclear magnetic resonance ( 1 H NMR), and carbon-13 nuclear magnetic resonance ( 13 C NMR). Results: The pretreatment of FFALF significantly (P < 0.01) reduced the frequency of micronuclei formation and the incidence of chromosomal aberration in a dose-dependent manner from the bone marrow cells of mice as compared to the cyclophosphamide induced group. The cumulative spectral data showed the presence of two flavonoids isolated from FFALF, i.e., apigenin and quercetin. Conclusion: In the present study, apigenin and quercetin have been successfully isolated from FFALF. The isolation of the above characterized flavonoids exerts antimutagenic activity against cyclophosphamide-induced genetic abnormalities in Swiss mice. In the future, it may be useful to prepare plant-based pharmaceutical preparation to treat various genetic or immunological disorders.